We have just updated our studio brochure to show off our new upgrades to Studio C and Studio D and the improvements to the studios overall. Even if you’re a regular at Studio 52 you may be surprised by some of the changes, get the download download brochure here. 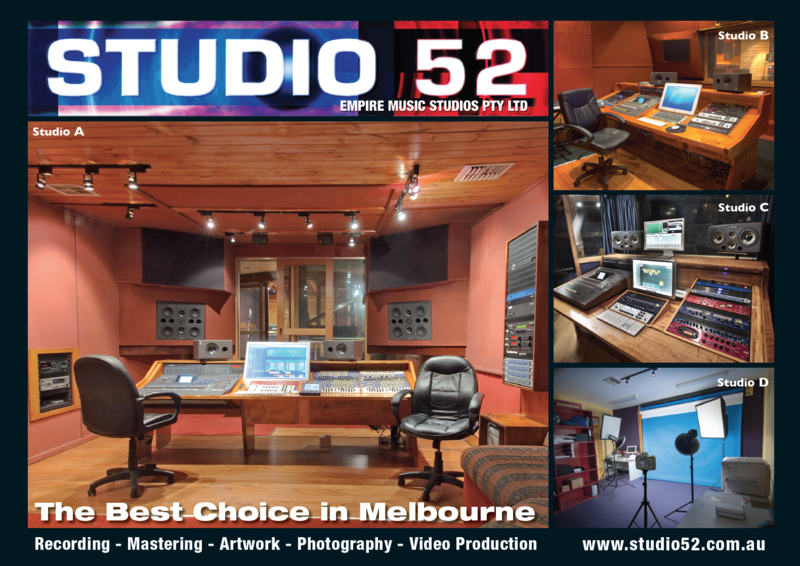 Studio 52 is Melbourne’s best choice for music production, mixing and mastering. Call Paul Higgins on 0412-686-252 to find out the best rates for next project, special pricing available now for all independent artists! This entry was posted in regular updates to the studios and tagged Apple, audio, black pearl, bounce, brochure, CD mastering, Collingwood, Empire MGM, head gap, Logic 9, mastering, Melbourne's best studios, metropolis, mixing, music, music clip production, music production, music video, Paul Higgins, platinum, Recording Melbourne, recordings, salt, sing sing, song arrangement, sound, spoken word, Studio 52, studio A, Studio B, studio C, Studio D, studios, TC Carter, voice overs. Bookmark the permalink.